While the controversial 2000 election was still being decided, Gallup found that 61 percent of Americans — including 73 percent of Democrats and 46 percent of Republicans1 — preferred amending the Constitution to elect the popular vote winner. Only 35 percent of respondents preferred the current system. The partisan gap widened even further after the 2016 election: A few weeks after President Trump won the presidency while losing the popular vote, Gallup found that 49 percent of Americans preferred changing to a popular vote system, compared to 47 percent who wanted to keep the Electoral College, with 81 percent of Democrats supporting a change compared to just 19 percent of Republicans.2 Even given some space after that heated election, there remains a major partisan gap in opinion over how to elect a president — Pew Research found in March 2018 that 75 percent of Democrats supported moving to a popular-vote system versus only 32 percent of Republicans. But 50 years ago, moving on from the Electoral College had bipartisan support. 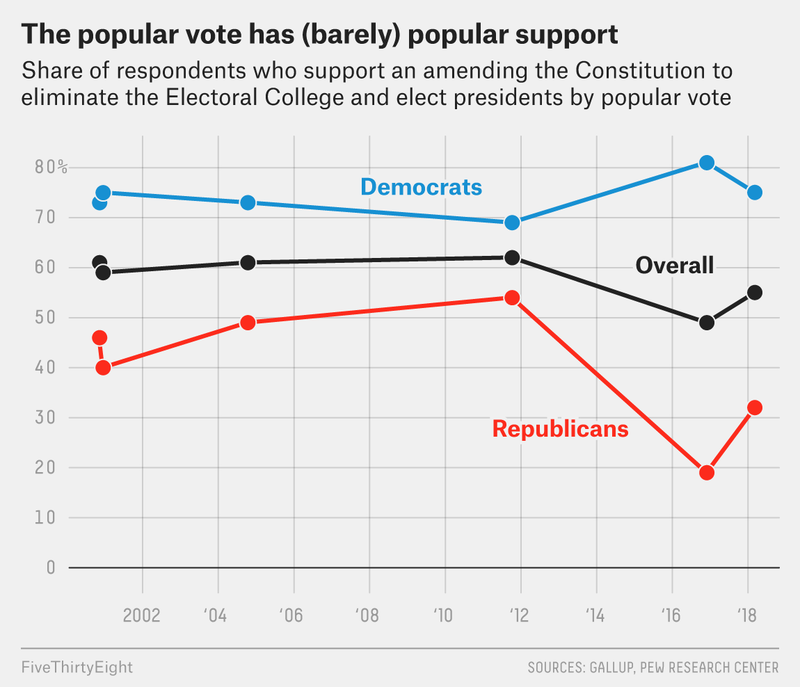 In May 1968, 66 percent of American approved of the idea of amending the constitution to replace the Electoral College with a popular vote system, according to Gallup. And there was no partisan divide: 66 percent of Republicans and 64 percent of Democrats approved. Six months later, Republican Richard Nixon defeated Democrat Hubert Humphrey while only winning the popular vote by less than 1 percentage point, and a post-election Gallup survey found 80 percent of Americans approved of changing the electoral system. The bipartisan support among voters and the fact that the 1968 election nearly produced a split between the popular vote and the Electoral College3 explain why there was bipartisan support in Congress in 1969 for a constitutional amendment to elect presidents based on the popular vote. The House passed it 339 to 70, with more than 80 percent of each party’s voting members lending their support. But small-state senators from both parties filibustered the amendment and it never got an up-or-down vote in the upper chamber. Each party’s numbers included independents who leaned toward that party. Again, including independents who leaned toward one party among that party’s totals. Not to mention the fact that George Wallace’s third-party bid tried to deny either Nixon or Humphrey a majority in the Electoral College.